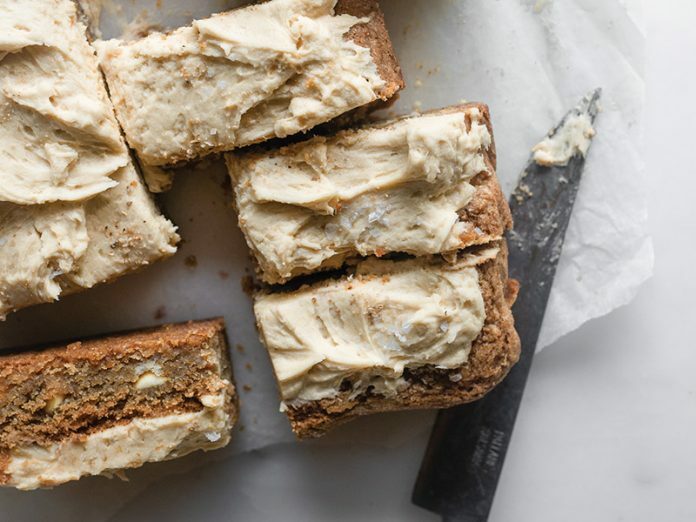 These Frosted Cappuccino Cookie Bars from Thalia Ho, the blogger behind Butter and Brioche, are a dulcet hybrid that’s part blondie, part cookie. Filled with soft pockets of white chocolate, hints of nutmeg, and a triple dose of coffee, they’re better than good. The thick blanket of Cappuccino Frosting, with its milky coffee undertones, is the real star. Find more recipes for baking with coffee in our January/February 2019 issue! Preheat oven to 350°F (180°C). Grease a 9-inch square baking pan. Line pan with parchment paper, letting excess extend over sides of pan. In a small saucepan, heat butter over medium heat, stirring frequently, until golden and melted. Remove from heat, and pour into a large bowl. Add sugars, whisking until combined. Add egg, vanilla, and coffee liqueur (if using), whisking until smooth and glossy. In a medium bowl, whisk together flour, coffee powder, baking soda, salt, and nutmeg. Add flour mixture to butter mixture, whisking just until combined. (Having some flour chunks throughout batter is OK.) Fold in white chocolate until evenly combined throughout dough. Place dough in prepared pan, and use a rubber spatula to smooth down top and help spread to edges. Bake until golden, just firm and crackled around the edges, and center has begun to set, about 20 minutes. Let cool in pan for 15 minutes. Using excess parchment as handles, remove from pan, and place on a wire rack to let cool completely. Using a large offset spatula or the back of a metal spoon, thickly spread Cappuccino Frosting onto cooled cookie in a swoop-and-swirl motion. Sprinkle with fleur de sel or flaked salt, if desired. Cut into 14 bars. Best eaten on the day of baking but can be stored in an airtight container at room temperature for up to 3 days. In a small bowl, stir together 2 teaspoons (10 grams) boiling water and coffee powder until dissolved. Let cool. In the bowl of a stand mixer fitted with the paddle attachment, beat butter and confectioners’ sugar at medium speed until fluffy, 3 to 4 minutes, stopping to scrape sides of bowl. Add coffee mixture, cream, and vanilla, beating until smooth and aerated, about 3 minutes. Use immediately.